The foundation continues to provide UNCW with invaluable guidance, leadership and support as it did when it began in 1962 as the Wilmington College Foundation. As a separate non-profit organization, the foundation has flexibility in receiving both cash and non-cash gifts to aid the university in many ways. The foundation is led by a 27-member volunteer Board of Directors. In addition to their own financial contributions, the members volunteer their time and expertise to assist the university with essential projects that help UNCW better serve students and the region. The UNCW Board of Visitors consists of over 50 volunteers appointed by the chancellor. Board of Visitors members serve as ambassadors for the university by helping to establish and strengthen UNCW’s connections with prospective donors and high-ability students as well as legislators and other governmental leaders. 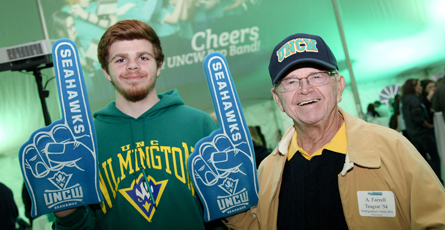 The role of the UNCW Alumni Association is to engage alumni in the life of the university and its students. Our goal is to inform alumni of opportunities for them to engage with UNCW so that they are inspired to get involved as alumni event participants, volunteers, mentors, employers, ambassadors (admissions or legislatively) and to be invested in UNCW by giving back philanthropically. We do this through regional, affinity, reunion, student and career-based programs. Dedicated parents who support our students with a donation of $1,000 or more each fiscal year, are encouraged to participate in the UNCW Parents Council. The council was created almost a decade ago and works hand-in-hand with the university administration, ensuring you are an informed parent. The group meets twice during the academic year, with one meeting during Family and Alumni Weekend in the fall and another during the spring semester. Between meetings, members serve as ambassadors in their geographic area to prospective UNCW students. Active participation in the UNCW Parents Council is a rewarding way to share in your student’s career. The primary mission of the Student Aid Association (Seahawk Club) is to support, strengthen and develop the intercollegiate athletic programs at UNCW by raising funds to support athletic scholarships at UNCW. It may also raise funds for the improvement and construction of physical facilities to be used by UNCW for athletic purposes and increase the university’s athletic scholarship endowment fund. The Student Aid Association may also raise funds to provide operational and supplementary support for our entire sports program. The Friends of UNCW is a volunteer organization that was formed in December 1963 to help Wilmington College (now UNCW) increase the library's holdings from 11,000 volumes to a minimum of 50,000 volumes, a requirement at the time for accreditation as a four-year institution. The Friends met that goal and have been steadfast UNCW supporters for more 50 years. The organization's current contributions include supporting a merit scholarship and annually funding special projects based on proposals from UNCW faculty and staff. We invite your use of library materials and reference services. Our hours are available here and our catalog can be searched here. Adult North Carolina adult residents (over 18 and out of high school) may purchase a Borrower's Card, valid for one year, for $25.00 upon presentation of a valid North Carolina driver's license or a valid military ID. The $25.00 fee is waived for citizens over 65 years of age. Youth with relevant university experiences, allowing them to apply what they already know, learn new material and skills, discover new areas of interest, explore career options, and ultimately value higher education. UNCW students with experiential and service learning opportunities, encouraging them to share their knowledge, practice their skills, serve as role models for youth, and develop an appreciation for and commitment to preK-12 outreach. Faculty and staff with outreach partnerships, supporting their scholarly engagement as mentors, content specialists and funding sources for programs that benefit UNCW students, preK-12 youth, and teachers. The Career Center offers a variety of ways for employers to reach UNCW students and graduates. Whether you want to hire a full-time or part-time employee, temporary help, or a student intern, the career center can connect you with well-trained, qualified applicants to meet your needs. UNCW is always interested in hearing from you about how we can work with you more effectively. UNCW is consistently named by G.I. Jobs Magazine as on of the Top Military Friendly schools in the nation and the UNCW Onslow Extension Site continues to dedicate all effort necessary to create the most powerful learning experience possible for student military veterans. In a book by J. Marshall Crews, "From These Beginnings," about the founding of UNCW, it states that "On September 4, 1947, at 4 p.m., Wilmington College, with seventeen faculty members, opened the doors to 238 students, seventy-five percent of whom were veterans.” Since that time UNCW has become one of the leading universities in the southeast and maintains a deep tradition of educating and collaborating with local military personnel, both active-duty and retired, along with their spouses and families. Visit the UNCW Bookstore online for apparel, accessories and gift items for graduates or any Seahawk fan. Thousands of student success stories unfold every year at UNCW due to your support. But why is it important to you?